3rd Row Seat, Heated Leather Seats, Navigation, Rear Air, 4x4, Trailer Hitch, Turbo Charged, Alloy Wheels, VOICE-ACTIVATED TOUCH-SCREEN NAVIGATI... TRANSMISSION: 10-SPEED AUTOMATIC W/SE... EQUIPMENT GROUP 202A. AND MORE! Third Row Seat, 4x4, Rear Air, Back-Up Camera, Satellite Radio, CD Player, Trailer Hitch, Aluminum Wheels Privacy Glass, Steering Wheel Controls, Child Safety Locks, Electronic Stability Control, Electrochromic rearview mirror. EQUIPMENT GROUP 202A 110V/150W AC Power Outlet, Remote Start, Chrome Platform Running Boards, Heated Steering Wheel, Advanced Security Pack, SecuriLock passive anti-theft system (PATS) and inclination/intrusion sensors, Intelligent Access w/Push-Button Start, Ambient Lighting, Power Tilt/Telescopic Steering Wheel, memory, SYNC 3 Communications & Entertainment System, enhanced voice recognition, 8 center LCD capacitive touch-screen w/swiping and pinch-to-zoom capabilities (when ordered w/navigation system), AppLink, 911 Assist and (2) smart charging USB ports, SYNC AppLink lets you control some of your favorite compatible mobile apps w/your voice, It is compatible w/select smartphone platforms including Apple CarPlay and Android Auto, Commands may vary by phone and AppLink software, VOICE-ACTIVATED TOUCH-SCREEN NAVIGATION SYSTEM pinch-to-zoom capability, SiriusXM Traffic and Travel Link, SirusXM Traffic and Travel Link includes a, MEDIUM STONE, LEATHER-TRIMMED 1ST & 2ND ROW SEATS 8-passenger seating, ENGINE: 3.5L ECOBOOST V6 auto start-stop technology (STD), TRANSMISSION: 10-SPEED AUTOMATIC W/SELECTSHIFT (STD). 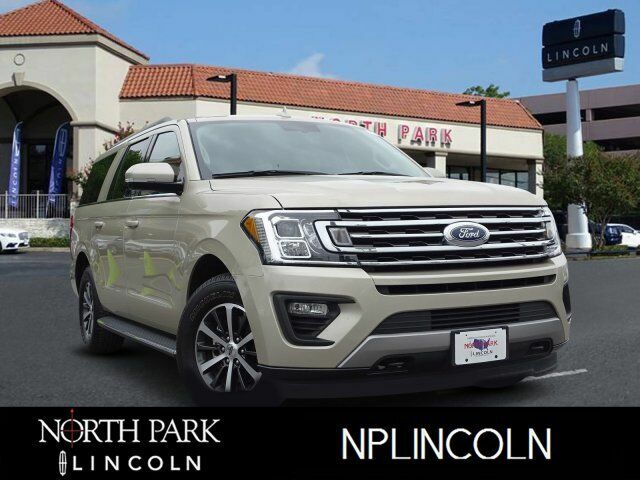 2018 Ford Expedition Max with White Gold Metallic exterior and Medium Stone interior features a V6 Cylinder Engine with 375 HP at 5000 RPM*.